04/03/18 - Large overhall of script. I have added a lot of new features so please take the time to go through the thread and figure out what you want to use. a small explanation will be given at each section. 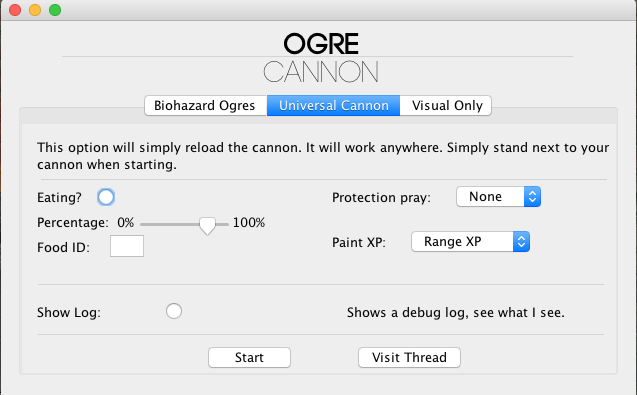 This consists of what was previously there, will run the cannon at biohazard combat camp ogres. The attacking methods include using the cannon only or for the player to also attack the ogres. (Please bare in mind you cannot alch/fletch if you are also attacking the ogres. TeleGrab - Will telegrab the seeds instead, please ensure air & law runes in inventory. Show log will display an extra window which shows any updates on the script. If you are having issues please use this when reporting them to me so I know where the issue is. This will maintain your cannon in any location. Please ensure your cannon is already set up and you are stood near it when starting the script. If there are multiple cannons at that location please make sure yours is the closes. Eating; self explanatory if you are in a location where you could be getting attacked back you may need to eat, select the button that you are eating, your eating percentage and your food ID. The script will do the rest. Praying; again pretty self explanatory, if you are in a location where you could be taking damage and want to use protection prayers please select which one. If you have prayer potions or super restores in your inventory it will drink one when it becomes most efficient to do so. Prayer potions is 7+PrayLevel/4 and super restores are 8+PrayLevel/4. This section does include a customisable paint. I did this as if you're in a universal area you may be doing a task or training something other than range so you have the option to chose between range, attack, strength or defence xp to show on the paint. This was designed for those who like to play somewhat more legit from time to time. This has no control over your system whatsoever it is all manual and solely visual aids. Select whether or not you are eating and if you are what % you would like to eat at, once below that you will receive an onscreen prompt to eat your food. Similar with Prayer, if you're praying it will notify you of when your points have dropped below the desired level. It will also notify you of when your cannon is our of ammo and broken to prompt you to reload and to fix. 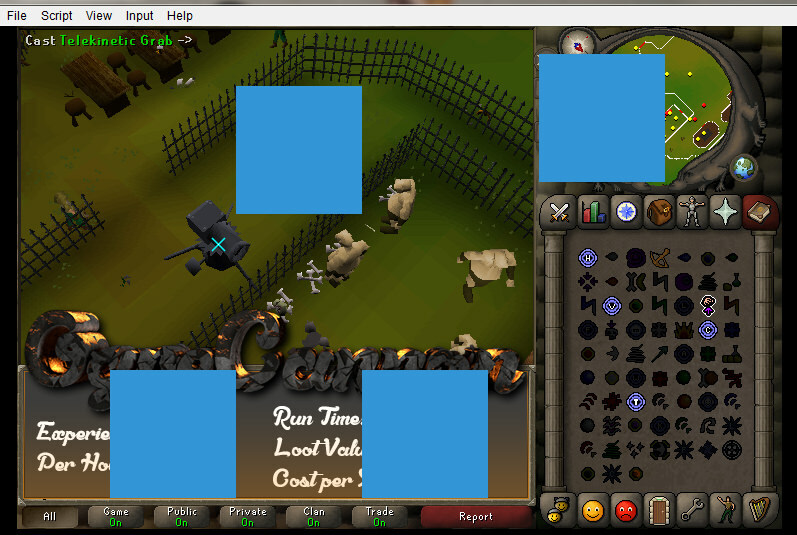 Resizable & Fixed screen functionality. -Sets up cannon if not already done so. -Will walk to the best spot before deploying as long as it's started inside the combat camp. -Please be aware it does not eat so if this is your choice, ensure your account can take a few hits from an ogre and survive. -If using Telekinetic grab ensure you have air and law runes in your inventory. -Attacking option as well as the cannon. Proggies - Paint has changed. New proggies appreciated. -Added a new GUI to make it easier to select what you want to do. -Added additional attack feature to attack along side the cannon. -Please note you must pre-equip your weapon & or ammo. -Also note that as you are not being attacked back I made this method up to incorporate an idle timer; during the attack animation it briefly resets to -1 (idle animation) so I had to come up with something that checks how long the animation has been -1 for. I set the fairly high so it shouldn't really cause any issues as I don't think there's a range weapon slow enough not to trigger the timer however if you have any issues please don't hesitate to contact me. I tested this with knives, darts, c'bow and short bow, all work fine. -Rewrote the firing/reloading method to make it less buggy. -Rewrote the xp/hour in the paint also to make it less buggy. -Changed the default camera angle to a much higher/natural viewing point. -Added an antiban also with 6 randomised features. -Added walk to spot before deploying so now just start the script anywhere inside the combat camp. -Added a failsafe for tele grab looting, just in case the spell is selected but the seed is no longer there it will deselect the spell so it doesn't try to continue the rest of the script whilst still having the spell selected thus failing. -Also fixed the spamming of the spell, it will now wait after casting it so in theory it shouldn't need the failsafe above but just in case. -Made the loot count slightly more efficient. -Enabled entire script to work with resizable mode. -Fixed issue with clicking the compass and getting stuck behind ogre cage. -Fixed tele grabbing issue on ranarr seeds. -Click on the paint to hide, click anywhere else to show again. -Sped up the attacking process and load up this thread on start till voted on poll. -Removed thread load on start but implemented restrictions. -Added a log for people to see as the built in one doesn't work. -Remade the paint, much cleaner and more professional. -Added drag to 16th Slot for alching. 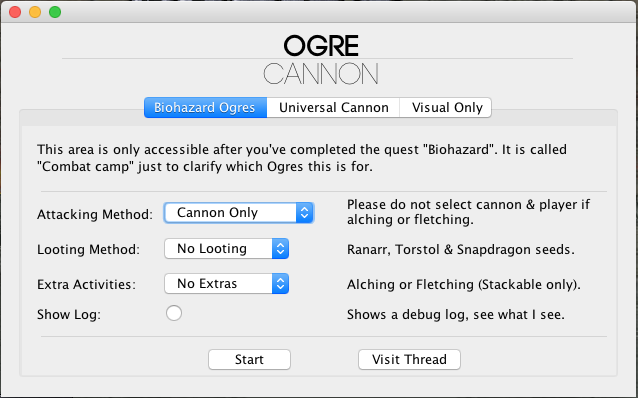 Updated GUI again to include all other features; added 3 tabs Biohazard Ogres, Universal Cannon and Visual Only. Please refer to the above tabs for their features/updates. Sounds really good, have been waiting for something like this but at the castle wars ogres - will do the biohazard quest and try it out as I've heard its more exp there - does it support ranging also or just cannoning? Thanks, any proggies or feedback please be sure to post or let me know any bugs! 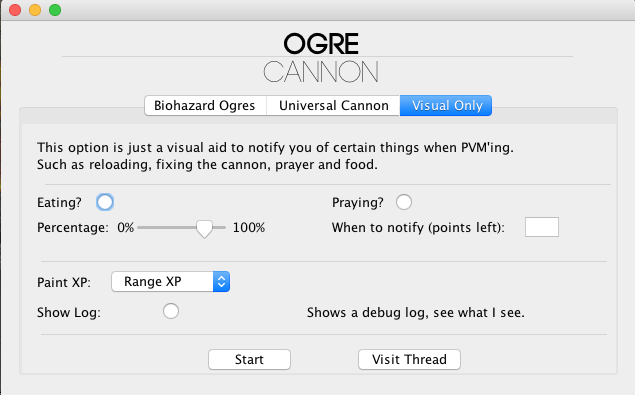 Although It's currently just cannoning, no current support for the player to attack the ogres as well. I've been waiting for this. I've been using an autoclicker for the past fortnight. First off, thank you for taking the time to make this! Are you considering the optional 'Use bow/crossbow in conjunction with cannon' feature in future releases? The angle it chooses to sit at seems quite unnatural to click a cannon and view the environment from such a low position. Is this intentional or will you be adding a higher view-point in future releases? I can have a look at including an additional attack feature, leave that one with me and I’ll see what I can do. Regarding the camera angle I can change that too, I never really thought about it to be fair just as long as it moved in order to do each function but again I’ll look into it and keep you updated. Does anyone know how much xp/gp loss p/h are we looking at with this script? Just want to compare it to xp and gp loss p/h at NMZ with a BP. All depends on what looting method if you are looting at all, ran for 10 mins with looting on and gp/xp was 1/1. 6gp/xp over a 2 hour stint, telegrab looting. Gear is black dhide chaps and vambs, archers ring, robin hood hat, leather armour, rune cbow. I've just pushed a new update, just waiting for it to be uploaded. See the thread for update details and let me know any more updates or things to fix. New version now on the SDN. If you need to check if you're in combat, ctx.player.local().interacting().valid() is what I use rather than animation checking. Not sure if it works when the monster can't fight back. Thanks for that, it will actually come in handy for my current project also! No problem. You have to dig a bit to find these things though. You have a lot of duplicate code, esp. with your herb tracking. If you make a class to have all the properties you need (herb ID, price, count, gained), it becomes much simpler and easier to manage. This is just how I would do it. First make the class with the right properties and its constructor. This constructor just means you insert the ID and the id, price and count properties are also initialised. In your start(), you make your HerbObj with the correct name and ID. Putting them all into an array makes updating easier, with the following helper function. OP. Thank you so much for taking the time to incorporate an attack feature and higher camera angle as previously suggested. It's very much appreciated! EDIT: The telegrab feature sensed a delay in telegrabbing after it already selected the object on the ground and cast the spell. It then proceeded to select Telegrab once more for the same item. Once realising it wasn't on the ground, it went to reload the cannon but didnt know that it needed to cancel the telegrab. I'm also finding it's letting the cannon run out of balls quite often. I'm attacking creatures, too. I’ll have a look at this this afternoon; really appreciate the help! To start with you are very welcome! The compass is part of the Antiban, it’s somebing I do when I play legit, it resets the camera to 0, 0 and then I raise the camera. I dunno if other people do that too but just makes it more life like. Ill take a look at the telegrab this afternoon also and I’ll do some testing to make sure it’s fixed. I did have some trouble with it ages ago so probably needs ironing out. Thabks for the feedback, will keep you posted! I've uploaded a fix for the tele grab issue where it goes to select the spell again. I've also added a failsafe (it shouldn't happen anymore but in case it does this will fix it.) so if the seed is no longer there and the spell is selected, it will deselect the spell. Should be added soon. I made the loot counter a little more efficient by merging the 3 into one however I've sent you a message about what you said, more for my own clarification than anything.